Andy Furnell hit the winner. 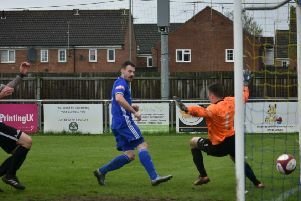 Veteran striker Andy Furnell fired Yaxley to a third win on the trot in the United Counties League Premier Division last night (September 28). The ex-Posh player hit the only goal of the game at Sleaford Town after coming on as a seond-half sub for Scott Bogusz. The Cuckoos have now moved up to ninth in the table.